Tampa Bay Lightning captain Steven Stamkos, who has played in 48 career playoff games including the 2014-15 Stanley Cup final, is at Rogers Centre on Friday to watch Toronto's game against the Detroit Tigers. Steve Stamkos knows a thing or two about playing for championships. The Tampa Bay Lightning captain, who has played in 48 career playoff games including the 2014-15 Stanley Cup final, was at Rogers Centre on Friday to watch Toronto's game against the Detroit Tigers. Now that his hometown Blue Jays are poised to make the post-season for the first time since winning the World Series in 1993, Stamkos couldn't help but notice the feeling of excitement the team has created around the city. "This is pretty special," the Markham, Ont., native said from the Blue Jays dugout before the game. "I think my dad still has the newspaper clippings from the back-to-back championships (in '92 and '93). I was 2 and 3 years old when that happened so not a lot of memories for me, but just being here in the summer, feeling the buzz in the city, it's crazy. "I can't remember a time where it would be one or two in the afternoon on a game day and it's packed around the Rogers Centre. People are in Jays gear, everyone's talking about them. ... so to be here to cheer for the guys, it's pretty special." 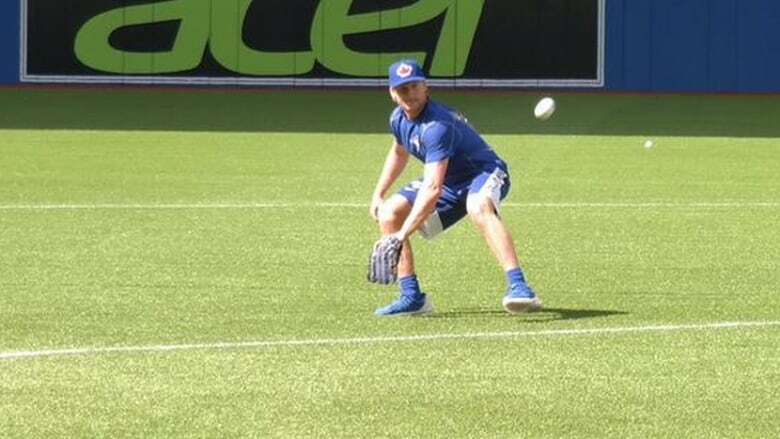 Stamkos had the Rogers Centre field to himself earlier Friday as he took batting practice and fielded ground balls. As a former baseball player as a kid with the Markham Mariners of the Markham District Baseball Association, he enjoyed the experience. "I think I was more excited to field the balls than to hit them," Stamkos said with a smile. "I've taken BP before but to actually get on the field and field balls and throw them, that was pretty fun." Stamkos, who had 43 goals during the 2014-15 regular season — and seven more in the playoffs — described himself as a "decent" baseball player. The 2008 first overall draft pick, three-time NHL all-star and two-time Maurice Richard Trophy winner even joked that despite his impressive hockey career, his dad still thinks he should have stuck with baseball. "At around 13-14, the age where as a Canadian kid you had to pick one sport (to focus on), that was when baseball was becoming an all-around thing and I obviously wanted to play hockey," Stamkos said. "But I still love the sport to this day and try to get to as many games as possible. "I play fantasy baseball with guys on our team, I just love the sport and love being around it." Stamkos has been to a few games at Rogers Centre this summer, including the Blue Jays' loss to the New York Yankees two weeks ago that snapped their second 11-game winning streak of the season. "I didn't want to bring that up," he said with a laugh. "But just being at that game, the atmosphere was amazing. I'd probably say that's the biggest sporting event I'd been to here in Toronto." The starting pitcher from that game — former Tampa Bay Rays ace David Price — is someone Stamkos had met before St. Petersburg. "My rookie year was when they went to the World Series so I got to go to those games, which was an unbelievable atmosphere," he said. "The support for (Price) has been pretty amazing from the fans here in Toronto. Obviously the team's doing great and he's off to a great start with the team. "These guys are having a blast. Any time you can play meaningful games down the stretch, that's the most fun."